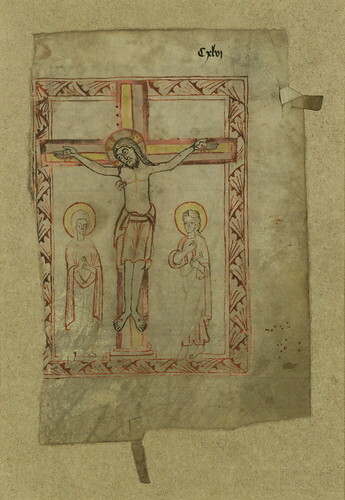 Leaf of a Missal with the Crucifixion and Canon of the Mass, Crucifixion, Walters Manuscript W.757, fol. W.757r, originally uploaded by Walters Art Museum Illuminated Manuscripts. This leaf once belonged to a small Missal, and was created in the late eleventh or early twelfth century. The distinct style of its miniature suggests it was made in Southern Germany, or possibly in the Tyrol region of Austria, where line drawing in colored inks had developed into a regional style. The recto depicts the Crucifixion, and the later redrawing of Christ, especially apparent in his face and feet, suggests it had been worn down through pious touch. On the verso is found the opening text for the Canon of the Mass, introduced by a historiated initial "T" containing a standing man wearing a short skirt. That the manuscript was well-used is attested to both by the heavy wear to the parchment, and by the two original manuscript tabs that were created as page markers for this important text and image. Happy Diwali Images We Hope you love our attempt in bringing a smile to the faces on your family members and relatives and friends by sending these latest Happy Diwali messages 2018 to them. Wish you a very Happy Diwali ahead of time! May Diwali festival bless your entire life and stuffed it with joy and calmness & might Maa Laxmi bless every new day that bring you amazing moments to cherish. Blast a few chains of sorrow! Take some rockets of wealth! Fire a few flowerpots of happiness! Bring happiness and cherishment in your own lives. Light bulbs of love! Blasting chains of regret! Shooting rockets of wealth! With this blessed day of Diwali, I hope that your upcoming year be full of good luck, prosperity and success!